UltraWater has raised the bar on the water filtration industry with 99.9% reduction of an exhaustive list of the toughest to remove water contaminants. Uncompromising water filtration results. Safety you can count on. Disinfectants Byproducts: Chlorine, Chloramine, Trihalomethanes, Halo-acetic Acids,etc. The AlkaViva UltraWater filter has taken our years of experience, knowledge, and expertise and combined water filtration -ionization technologies in a proprietary process to provide the ultimate protection from drinking water contaminants. The UltraWater filter uses the highest quality medias available and then transforms them into solid forms to literally block contamination from passing through and ending up in your glass. This creates a greater contact time with the water and removes much higher percentages of contamination than traditional loose media beds. The UltraWater Filter offers superior removal of chlorine, chloramines, disinfectant byproducts, VOC’s, pharmaceuticals, and heavy metals such as mercury, lead, nickel and iron (most to non-detectable levels in laboratory testing – UltraWaterResults). In addition it greatly improves taste and odor giving you a great tasting and clean glass of water. 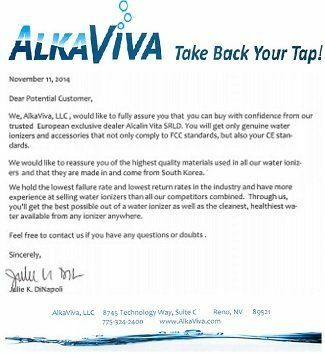 AlkaViva is happy to offer you the opportunity to take back your tap and use the most advanced water ionizer filter available in our industry. Only AlkaViva offers UltraWater filtration Technology that removes most contaminants in tap water to nondetectable levels. Bottom Line: Truly the best water ionizer filter on the market today. AlkaViva spent two years in the devlopment of the UltraWater filtration technology and it is WELL worth the extra money. If you own a model of water ionizer that is not on this list, but this water ionizer filter fits your water ionizer , please let let us know through our contact page so we may add your model to this list. How do I know when my water ionizer filter needs to be replaced? All water ionizers that use this filter have either a digital numeric readout or a progressive bar indicator. When the numeric readout reaches 9999 (or 999 on 3-digit readouts) or if all of the water ionizer filter bars are lit up, generally a water ionizer filter light will begin to blink letting you know that you’ve reached the maximum capacity of the water ionizer filter. This can also be accompanied by the water ionizer playing a constant tune. This can happen anywhere between 6 to 12 months, depending on the amount of filtered water your family uses. When that occurs, it’s time to change the water ionizer filter. Also, you should change the water ionizer filter at least every 12 months, whether the filter use light is blinking or not. It has been two years since I changed my water ionizer filter last, but I don’t use the water ionizer that often. Do I still need to change the water filter? Has this water filter been laboratory tested for contaminant removal? How can such a small water filter remove so much? Water filtration technology has advanced to the point where we can remove more contaminants in water using a smaller footprint because of the greater “surface area” of the internal water filter media. 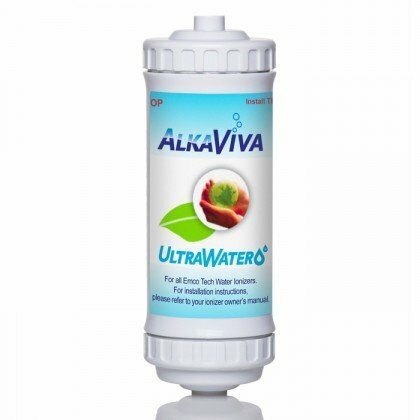 The proprietary media used inside the AlkaViva UltraWater filters are much “finer” than any previous traditional water filter media, and its proprietary design forces ALL the water through the water filter media before it can enter the water ionizer. Other water ionizer filters contain “gaps” that allow water to pass through the water ionizer filter with making any contact with the water filter media – allowing contaminants to pass untreated. This is NOT true with the AlkaViva UltraWater filters. ALL water MUST pass through the water filter media before it can exit the water filter housing. That is why it took AlkaViva two years of production to get the incredible results, inside of a water filter small enough to go inside your water ionizer. Does this water filter remove fluoride? Fluoride is one of the hardest contaminants to remove from drinking water, and requires its own very specific media for removal. There just wasn’t enough room inside the regular UltraWater filters to fit the fluoride media as well as the other media. Therefore, AlkaViva created an UltraWater Fluoride-Arsenic Shield, which is an internal and external water filter that can be used in conjunction with the regular UltraWater filter, in water ionizers that have two water filters. If you have an Athena JS 205 water ionizer , you would purchase the Fluoride-Arsenic Shield for INSIDE the Athena JS 205 water ionizer , and there is another INTERNAL water ionizer filter Fluoride-Arsenic Shield for INSIDE the Vesta GL 988 water ionizer (the Vesta GL 988 water ionizer has its own water filter size). 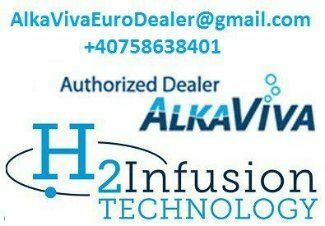 If your water ionizer has only one water filter, then you would use the AlkaViva UltraWater filter as the main water filter in your water ionizer, and then add the EXTERNAL fluoride-arsenic pre-filter between your water source and your water ionizer. Finally, rest easy that you have the best price and quality from AlkaViva. Buy with confidence. We are an authorized AlkaViva distributor and guarantee caring and professional customer service.We guarantee top value and service and no dishonest discounting on inflated prices!